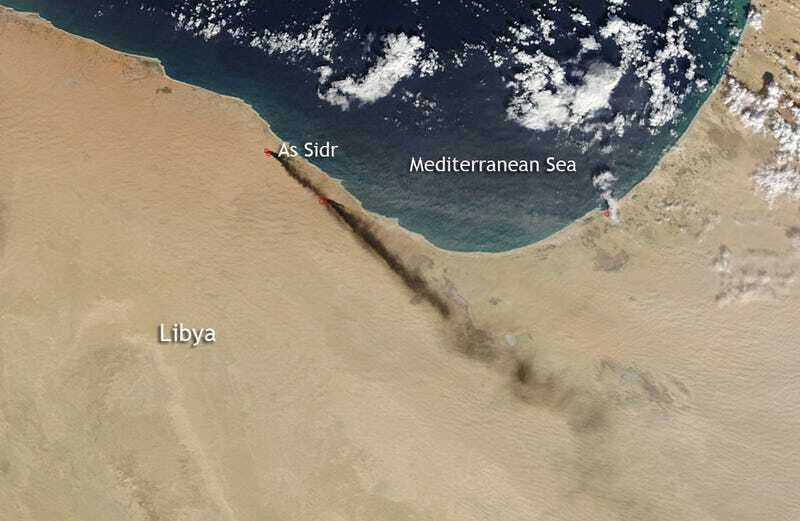 NASA’s Terris MODIS camera reveals how much black smoke is being pumped into the air because of the oil refinery fires in Libya. According to NASA, the fires were “started by attacks on oil terminals in Libya in very early January.” That’s a hell of a lot of smoke. The stream of black smoke that emanates from the refinery has grown tremendously as the fires caused by the initial shelling have spread to giant storage tanks. These fires are reported to be raging in Sidra, on the coast between Sirte and Benghazi. Actively burning areas, detected by MODIS’s thermal bands, are outlined in red. Below, you can see when the fire first started and how (comparatively) little smoke there was. The oil fire was supposedly started by attacks of the oil storage tanks from the Islamic State.